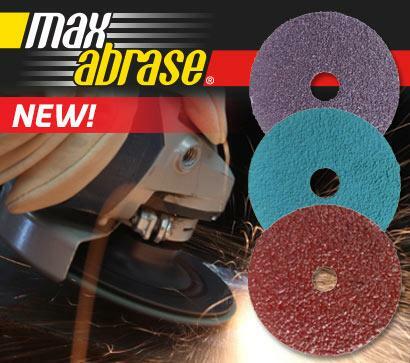 Introducing MaxAbrase Resin Fibre Discs! The range includes Aluminium Oxide, Zirconia and Ceramic Discs. Each type is available in a variety of sizes and grits. Brilliant all Purpose discs with good performance and overall economy. These discs have no halogen producing grinding additives and allow cost effective stock removal. 100 - 178mm dia, in P16 - P80 grits. Premium Zirconia grit for ultimate grinding performance. Advanced bonding formulation provides cool grinding action, cooler running extends the life of the disc. Suitable for high production applications in all industries. 100 - 178mm dia, in P16 - P80 grits. Suitable for aggressive grinding and maximum stock removal, best for hard materials. Designed to reduce heat build-up. 100 - 178mm dia, in P16 - P80 grits.